SKU: WS283-9X12. 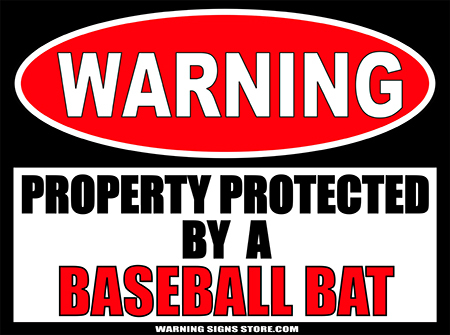 Categories: Funny Signs, gaming/geekism, Novelty Signs. Tags: Terminator, Warning Signs. a person or thing that terminates. In this instance, I think it is safe to say that we’re not talking about a line. We’re talking about a Terminator. One who terminates. One who causes things to end. One who is capable of causing things to end. One who causes things to end in quick, cold-blooded, efficient, heartless, no-messing-around kinds of ways. Are you shuddering with fear yet? Exactly! 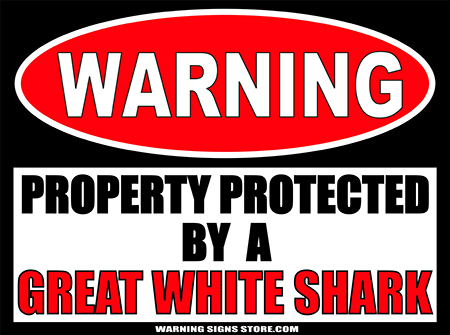 And that’s just what any potential intruders will do when they see this sign displayed in front of your property. They’ll shudder, and they’ll shudder with fear. They may even wet their pants to don’t post this sign close to the carpet. If you do, we can’t be held responsible for any carpet cleaning bills. 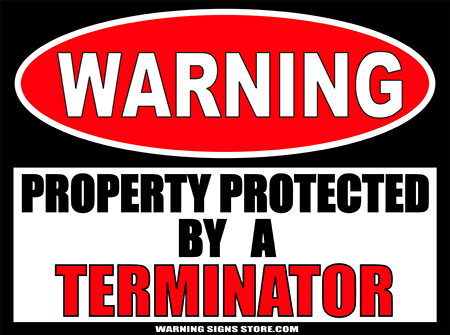 This Property Protected by Terminator sticker measures out to approximately 9″ x 12″. It is printed in a glossy finish with eco-friendly inks on a premium vinyl polymer. Our inks are UV resistant and designed to last 7-10 years, indoors or out.